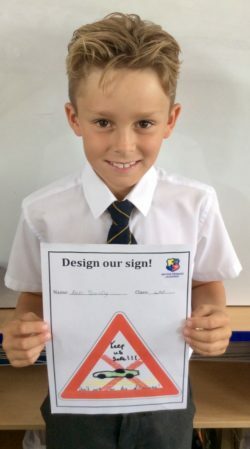 The Learning Village > Milton News > Our road sign winner! Many thanks to all who have entered the competition. Our proud winner is Ben Emery. Ben’s design will be made professionally in to a sign to be fixed to our front gates. The sign urges parents/carers/adults to keep the children of Milton Primary safe by not parking on the academy driveway.